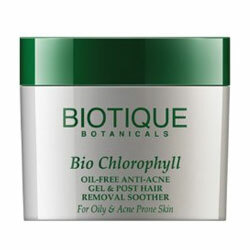 Biotique Anti Acne Gel - Worldwide Shipping. Recommended for post hair removal, to soothe, condition skin against redness & irritation. Chlorophyll is the "green" in all plants, meant to absorb and harness the energy of the sun involved in photosynthesis. It is highly valued for its antiseptic and soothing properties.